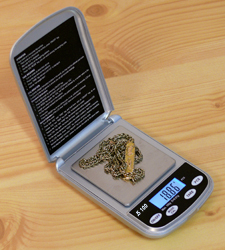 On our website you will find a wide range of scales for gold for weighing both gold and jewels, with an option to choose weighing units (grams or carats). All our scales for gold can be verified. The data obtained with scales for gold can be transferred to a PC with RS-232 interface and the optional software to check weighing values. 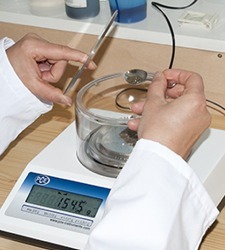 For example, verified EG series laboratory scales fulfill almost all the requirements for highly precise calculating of the weights. Due to their high quality, scales for gold have three years guarantee. This model of scales has RS-232 interface which can be connected to a computer or printer. Scales for gold must be verified if they are used to determine price of gold or precious stones by weight. 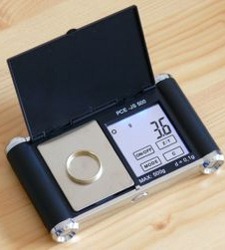 Verification can be carried out by PCE-Instruments. You will receive verified scales for gold including the verification certificate and your postal code details. If you can't find the scale for gold you are looking for, please contact us and we will help you find the best solution which suits your needs: UK customers +44(0) 23 809 870 30 / US customers (561) 320-9162. Our technical staff will advise you regarding our products. Our engineers and technicians will be happy to help you with the scales for gold, and of course, with the other products in the field of regulation and control, and measuring instruments. Apart from DIN ISO calibration certificate, all scales for gold can be certified according to the ENAC standard. Besides, verification in PCE-Group office is also possible (for an extra price) or it can be carried out by your local authorized verification centre. a) In trade relationships, when the price of the product is determined by its weight. b) For Official activities such as determining rates or sanctions. If an additional information about verification of jewellery scales is required, or if you are not sure whether you need verified scales, you can contact your local authorized verification centre. Verification of jewellery (only for selected models) can be done when scales are ordered or they can be sent for a periodical verification. Once an official verification has been done, scales for gold cannot be recalibrated using an external calibration weight. The first verification is valid for two years, but every other verification is valid for one year and must be done annually by the authorized verification centre.